While cartoon and film fans are still oohing and aahing over last week's unveiling of Popeye the Sailor: The 1940s Volume 1 from Warner Archive (and rightfully so! ), this past Tuesday also brought another (slightly) cartoon-related title from the Archive with the Blu-ray release of The Sea Hawk. The 1940 Errol Flynn action/adventure is making its high-definition debut through WBShop.com and other online retailers. Among the disc's extras is the 1940 black and white Porky Pig cartoon Porky's Poor Fish, using the same remastered transfer from the Golden Collection Volume Four. This release marks the first time Porky's Poor Fish has been presented in 1080p high definition. The Sea Hawk is now available online and retails for $21.99. Order it now on WBShop or Amazon. On Wednesday, December 19, Jerry Beck will appear on the year's final regular episode of Stu's Show, the online series hosted by pop culture/television historian Stu Shostak. The show is a video/audio simulcast, so you will be able to either listen or watch it live. The show will air at 7PM EST and is available as a free stream for those who tune in live (afterward, fans can purchase a "rerun" of the episode online). Information on the various ways to access the show can be found on its web site: www.stusshow.com. With the year coming to an end--and with Jerry making his last regular appearance on the show way back in March--there will be a lot to go over in the world of animation, including recent theatrical releases, the Annie nominations, and likely even a look ahead to the upcoming Oscar race. And surely, the home video discussion will be dominated by the subject of Warner Archive's Popeye the Sailor: The 1940s Volume 1 Blu-ray/DVD release. Also, for those of you who watch the video feed, Jerry will bring his now-traditional batch of cartoon rarities to screen. As always, please keep in mind that Jerry only works as a consultant for Warner Home Video (and other labels) on select projects. He does not have final say on programming or release matters; he can only try to comment on situations as best as he can...and even then, he is sometimes contractually required to not say anything about certain upcoming releases. The information he gives is never meant to be inferred as any sort of official statement from a studio and that they can and do change plans on a whim without telling him. Anything Jerry is authorized to reveal will be said during the show. You can send questions via the web site linked above, and Stu may or may not read them to Jerry during the show. And of course, as we say every time Jerry appears, do NOT bug the show with "When will this cartoon or show come out on DVD?" questions. Again, anything video-related that Jerry's allowed to reveal will come up during the show. As always, we will be posting live news updates as the episode airs on our Facebook page. If there is any major DVD or Blu-ray news announced, we will of course report it here after the show. Regardless, do plan to watch or listen to the episode yourself! Jerry Beck is coming to Stu's Show December 19! Joy to the world indeed! Yesterday was a pretty big announcement day from Warner Archive for fans of classic animation. We'll get to the big story in a moment, but we definitely wanted to mention that the label did make an actual Looney Tunes-related announcement, too! For classic movie lovers, Warner Archive has set the 1940 Errol Flynn action/adventure film The Sea Hawk for Blu-ray release on December 18. Boasting a brand new high definition master of its restored theatrical cut, the Blu-ray also includes the extras from the film's past DVD releases. Utilizing Warner's perennial "Night at the Movies" concept, among the bonus features will be the 1940 black and white Porky Pig cartoon Porky's Poor Fish. Using the same remastered transfer from the Golden Collection Volume Four, this Blu-ray will present the short for the first time in 1080p resolution. In other news, Warner Archive also announced the long-awaited, oft-requested, and already highly anticipated home video debut of the Famous Studios color Popeye cartoons! Featuring the first fourteen Famous color Popeyes, the one-disc Popeye the Sailor: The 1940s Volume 1 will be released on both Blu-ray and DVD on December 11. This will of course mark the first official home video release for all of these cartoons, and they have all been remastered from brand new 4K scans of their original Technicolor negatives! So there will be no Porky Pig 101-style screw-ups. The Blu-ray will of course be pressed, but at press time it looks as if the DVD edition will be a burn-on-demand issue on DVD-R discs. It seems as if we hear this every time there's a classic animation release, but Jerry Beck has stressed that the future of quality classic cartoon releases will depend on how well this title sells. And unlike with Porky Pig 101 where the presentation was a factor, this time there are no excuses. If Popeye doesn't do well, then this will most likely be it for classic animation from Warner Archive. So seriously, if you have even a passing interest in Popeye, definitely order this title to help ensure that more releases of Warner's classic cartoon properties come our way. Once again, it all depends on us. Popeye the Sailor: The 1940s Volume 1 is scheduled to be released on December 11. Pre-order the Blu-ray for $21.99 or the DVD for $19.99 on WBShop. The Sea Hawk, meanwhile, is scheduled to be released on December 18 on Blu-ray only and will retail for $21.99. Pre-order it now on WBShop. It's been a month since the Stars of Space Jam DVD series was unleashed onto the public and we're finally able to report some more details on how these hastily assembled compilations turned out. At the time of our last update, only the Bugs and Daffy volumes were readily available to review, as most physical stores didn't stock the other collections in the series. Needless to say, the results were a mixed bag, which didn't make a lot of people confident about the other titles. Fortunately, though, the Road Runner and Tweety collections turned out slightly better, but we're grading on a curve. And again, we've reached out to Warner Home Video numerous times to get information about the condition of the cartoons but were ignored, and with very few stores actually stocking these titles we had to wait until copies were made available to check out. Old-friend-of-the-site Matt Hunter was able to offer some details on our Facebook page while many of us were still waiting for our own copies, and we thank Matt so much for his help and support over the years. Okay, let's get the obvious information out of the way. Gee Whiz-z-z-z-z; Zoom and Bored; Fast and Furry-ous; Hook, Line and Stinker; Canary Row; Putty Tat Trouble; Snow Business; and Sandy Claws are all the same remastered versions previously seen on past Golden Collection and Platinum Collection volumes. As for the new-to-DVD shorts, Zip 'n Snort, Hot Rod and Reel!, Tree Cornered Tweety, and Tweet Zoo are unremastered, uncut, and in full frame. And thankfully, unlike Hare Splitter and Boston Quackie on the Bugs and Daffy discs, they all play at their correct speed. The one x-factor in all this was whether or not Tree Cornered Tweety and Tweet Zoo were going to be remastered, as they had both appeared that way on the Japanese I Love Tweety Vol. 2 DVD from 2001 alongside many of the same transfers of Tweety cartoons that showed up on the first few Golden Collection volumes. We covered these releases and detailed these specific masters over on our Tweet Teriyaki page here on the site. Unfortunately, instead of utilizing these remastered copies, Warner Home Video opted to go for inferior versions, ones likely prepared for either broadcast or the original Stars of Space Jam VHS releases from 1996. Below are screen grabs and comparisons of the two cartoons from both I Love Tweety Vol. 2 and the Stars of Space Jam DVD. We've used the same layout as on our Tweet Teriyaki page, so hopefully we didn't screw up how that looks when adding it to the news page here. Clearly the I Love Tweety masters still look better, and honestly if one has the resources and ability to watch a Region 2 DVD, we'd still recommend tracking that one down over getting the Space Jam disc. But if you're less concerned about specific quality and just want the two new cartoons, then yeah for five bucks or so the Space Jam DVD is a cheap and easy purchase, but buyer definitely beware. Really at this point the only Stars of Space Jam information we don't have yet is what kind of condition Fright Before Christmas is on the Taz DVD. We'll report on that eventually just for the sake of completeness, but we're not losing sleep over it right now. The Stars of Space Jam collections are now in stores on DVD only and retail for $9.97 each. Order them now on Amazon. "What a revolting development this is!" Well, we didn't want to believe it, but we all knew this was coming. First impressions of the Stars of Space Jam DVDs are not good. Quality control is all over the place, which is a little concerning considering how little "new" work needed to be done for these collections. Nevertheless, the results are bad, almost frustratingly so. At the time of this update, only the Bugs and Daffy compilations have been made available to review, as it seems as if most physical stores did not receive the other collections in the series (if they were carrying the series at all) and online pre-order are only now arriving in the hands of consumers. We will either add to this update or post a separate update once the other Stars of Space Jam discs have been checked out. Again, Warner Home Entertainment did not respond to multiple requests for information regarding the condition of the shorts, so all of this information comes from actual viewing of the DVDs. As expected, Homeless Hare, Forward March Hare, Ali Baba Bunny, Fool Coverage, The High and the Flighty, Stupor Duck, and Daffy Duck Slept Here are all the exact same remastered versions used on past releases (Golden Collection, etc.). No surprise or concerns there. Onto the good news, what little there is. All of the cartoons are uncut and have their correct soundtracks (as sad as it is to now have to specifically check and verify that for a Warner release). Apes of Wrath and Person to Bunny are the same remastered versions used on the first two Looney Tunes Super Stars DVDs (Hare Extraordinaire and Frustrated Fowl)...only this time they are finally presented in full screen instead of that awkward cropped widescreen format that caused much outrage back in 2010. It's doubtful any extra consideration was given by the studio as to which version to include apart from just using the full screen ones because that's what the original 1996 cassettes used, so it would be wise to not get one's hopes up for future fan service. Consider this turn of events merely a nice surprise. As for the three other cartoons, Hot Cross Bunny, Hare Splitter, and Boston Quackie are all unremastered and taken from older transfers, but it gets worse. Hot Cross Bunny suffers from a weird crackling sound throughout the soundtrack. Meanwhile, both Hare Splitter and Boston Quackie are time-compressed versions--if you've ever watched a post-1948 Looney Tunes short on Cartoon Network or Boomerang and it sounded sped up (particularly in the opening music), then you know exactly what we're talking about. Without going into all the boring technical back-and-forth details about it, these versions started as PAL masters prepared in Europe, which play at 4 percent faster than the standard NTSC versions in North America due to frame-rate differences between the two color formats. The only reason these versions even started trickling onto Cartoon Network in the last couple of decades is because for many of the cartoons, these are the only copies that have Spanish language tracks attached to them. The last point is ironic only because the Stars of Space Jam DVDs only feature the English audio tracks. This is the first time the time-compressed masters have turned up on home video in the United States. And again, these versions were created merely for broadcast purposes and were never intended for video release--especially since correct-speed versions of both Hare Splitter and Boston Quackie have been released on home video in the past. Chalk this up to either laziness or apathy, but it's embarrassing. To get better copies of the three cartoons in question, one will have to do some digging. A clean-audio copy of Hot Cross Bunny has been included as an (unremastered) special feature on various disc releases of the classic The Treasure of the Sierra Madre (such as on the two-disc special edition). A correct-speed version of Hare Splitter is an extra on most releases of Adventures of Don Juan, but with one caveat: for whatever reason, this master is missing the "That's all, Folks!" end tag. And while Boston Quackie is otherwise unavailable on DVD, the correct-speed version is on the Stars of Space Jam: Daffy Duck VHS cassette and on the Guffaw and Order laserdisc. We're still trying to figure out how to best catalog these errors and issues on our various guides throughout the site. And in the meantime, we're still waiting on feedback on the Road Runner, Tweety, and Taz titles in the series. But we're not optimistic. And with bated breath we have arrived at what is surely the oddest release day in quite some time, as Warner Home Video has unleashed the 1996 Stars of Space Jam VHS series onto DVD. Marking the first time the studio has done a straight disc release of an existing Looney Tunes cassette collection, all five titles in the main U.S. Space Jam series are now available in stores and online. At press time, there is still no word on the condition of the shorts, nor have any reviews been posted online. Normally we wouldn't be this cautious about such information, but with so many x-factors and unanswered questions about these releases--the state of the remastering, the aspect ratio of certain shorts, etc.--and considering the fact that these are intended to merely be dump-bin budget titles, we're choosing to tread lightly. Let's hope for the best but not be surprised for the worst, more or less. Once we get firm word on the condition of the new-to-disc shorts, we'll of course make the customary updates and tweaks to our various guides throughout the site. And of course, if there are any reported problems, we'll discuss them here as well. With just a week to go before the line's release, information is finally trickling in on where the upcoming Stars of Space Jam DVD series will be available in physical brick-and-mortar stores and for how much. Marking the first-ever DVD edition of the 1996 VHS collection, the five releases are still scheduled to be out on October 9. As had been suspected, the Stars of Space Jam titles will be featured at Target and Walmart stores in their budget DVD sections. At the moment, Target is listing a $5.89 retail price for each compilation, while Walmart will be selling them for a straight $5.00 each. Amazon has already adjusted their price on most of the titles to price-match with Target. If the low price point wasn't good enough news, it seems as if some stores across the country are already receiving their supply of Stars of Space Jam DVDs, readying them for the street date. This information comes from Brickseek, which is a third-party web site that tracks store shipments and inventories based on UPC and SKU numbers. Consumers can look up specific items and search posted store stock based on their zip code. NOTE: Brickseek is an independent web site that is not affiliated with any specific retailer, and they stress that stores' actual stock may not necessarily reflect what is listed on Brickseek, nor are stores under any obligation to honor inventory reports posted on Brickseek. And of course, stores legally still have to honor the studios' release dates and cannot sell titles before then, regardless of what they already have in stock. Please only use Brickseek as a guide as to where to start looking on October 9, not as gospel. We stil do not know in what kind of condition the actual cartoons will be on these compilations, despite numerous requests sent to Warner Home Video for information. Given the nature of budget releases, this could go either way. The Stars of Space Jam collections are scheduled to be released on October 9 on DVD only and will retail for $9.97 each. Pre-Order them now on Amazon. After being first (surprisingly) announced earlier in the week, the five titles in the Stars of Space Jam DVD series are now up for pre-order on Amazon, our site's online store of choice. The first-ever DVD edition of the 1996 VHS collection, the five releases are still scheduled to be out on October 9. There is still no word yet if the new-to-disc cartoons will be remastered. We have reached out to Warner Home Video for information, but we're not optimistic that they will respond. In the meantime, Brian Martin, a reader on our Facebook page, told us he contacted Jerry Beck to ask if he had any insight in these releases. As we figured, Beck is not involved with this line. The Stars of Space Jam collections are scheduled to be released on October 9 on DVD only and will retail for $9.97 each. In what may be the oddest, most out of left field animation-video news of the decade, Warner Home Video has announced the DVD release of the five-volume Stars of Space Jam series, initially issued on VHS back in 1996 to promote the mediocre Michael Jordan live-action/animation hybrid. All five main titles in the series will be released as individual DVDs on October 9. The overseas-only sixth volume in the series, Space Tunes (which itself was eventually released in the United States in 1998 as Marvin the Martian: Space Tunes), is not a part of this announcement. Warner's ad materials do little to shed any light on the raison d'etre for this announcement--no mention of the long-rumored Space Jam 2 or even the Space Jam web site meme to manufacture any sort of relevance. The only hype offered are a few vague, citation-free "facts" about the movie's supposed popularity, like "Almost half of kids 6-12 (49%), have watched Space Jam" and "It has been the overall #1 movie, on nine different networks, seven of 10 years on cable." Whatever. It's still a lousy movie. Even stranger than the announcement itself is the news that a couple of the collections in the series have been adjusted from their original VHS issues, with one or two cartoons replaced by others to create a different running order. We do not know if the cartoons will be newly remastered, use previous DVD masters, or will simply port over the same transfers originally used on the VHS releases (as depressing as such an option would be). There doesn't appear to be any obvious reason why some cartoons were replaced with others. We don't know if Tree Cornered Tweety or Tweet Zoo will be the same masters as used in Japan. STANDARD VERSION PRESENTED IN A FORMAT PRESERVING THE ASPECT RATIO OF ITS ORIGINAL TELEVISION EXHIBITION. But considering the wording seems to be based solely on the whims of whoever is copying and pasting it for a given release, take that with a grain of salt. Even when Space Jam's Bugs Bunny is on terra firma, the fun is out of this world. Hot Cross Bunny, the first of six hilarious escapades, is Bugs at his buggiest. He's the subject of a scientific scheme to turn a rabbit into a chicken. Homeless Hare delivers high-rise hijinks when a builder intrudes on the furry fella's home, sweet burrow. The rabbit turns Romeo, throwing his rival a curve and an exploding carrot or two in Hare Splitter. Then domestic tranquility gets tweaked when a gorilla's family bundle of joy turns out to be a certain rabbit in Apes of Wrath. Next, draftee Bugs tries to be all he can be in Forward March Hare. Finally, After a goofed up left turn at Albuquerque (on their way to Pismo Beach), Bugs and Daffy end up in a treasure cave in Ali Baba Bunny. What's up, Doc? Plenty of fun, that's what! Of the thousands of uses of duct tape, we suggest... Sorry. We mean duck tape, which has one use: cartoon fun, in this six-caper showcase of Space Jam's Daffy Duck. The first two episodes show the fouled-up one at his flim-flammiest. He's an insurance salesman who wheedles Porky Pig into a policy in Fool Coverage and peddles gags for every occasion to Foghorn Leghorn in The High and the Flighty. His quest for fame propels him to hog (no offense, Porky) the camera when Bugs Bunny is spotlighted for the Person to Bunny show. Cluck Trent, mild-mannered reporter, presto-changes into Stupor Duck; and mystery on a train awaits Boston Quackie. All aboard! Wrapping these tales: In Daffy Duck Slept Here, Porky Pig must share the only vacant hotel room in town with Daffy, who makes the night uncomfortable for him. The cartoon collection of Space Jammers Wile E. Coyote and Road Runner roars along with their own self-styled, fast-break frenzy. The program z-z-zips in Wile E. Coyote's jet-propelled scheme in Gee Whiz-z-z-z-z-z-z, then z-z-zooms in Zoom and Bored when Coyote flies here, there and everywhere while tangled up in a harpoon line. Fast and Furry-ous chronicles the historical, hysterical first encounter of Accelleratti Incredibus and Carnivorous Vulgaris. Road Runner keeps the fun on track while at the controls of a locomotive in Zip 'n Snort. Next, one of the dogged one's greatest chain-reaction whatchamacallits grabs him VHook, Line and Stinker. And Hot Rod and Reel provides the answer to how you stop a jet-propelled unicycle. (Answer: You don't.) Beep-beep! You tawt you taw a putty tat in Space Jam? Now you can enjoy the antics of that canary-hungry cat and the cat-wary canary in this six-cartoon laughfest. To catch his prey in Canary Row, Sylvester will be an organ grinder's monkey. Putty Tat Trouble has the little guy seeing double: Two cats pursue him. There's no business like Snow Business when a blizzard strands Sylvester with his would-be meal, and a day at the beach awaits both in Sandy Claws. Tree Cornered Tweety chronicles the case of a would-be birdnapper. 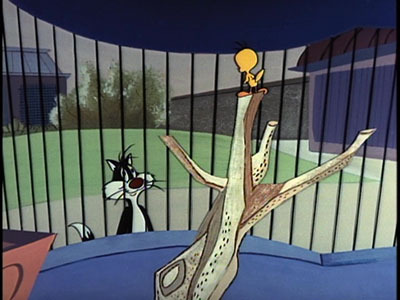 And a zoo's-who of animals stands in Sylvester's way to his feathered goal in Tweet Zoo, an episode that makes the feline vow, "Birds are off my list!" Somehow, we don't believe him. From outer space to outta control! Space Jam's Tasmanian Devil is on a six-episode rampage in this greatest-hits cartoon assortment. In Devil May Hare, it's not surprising that Bugs Bunny wonders just what the devil a Tasmanian Devil is, because this is the spinning diablo's first screen appearance. A Bedevilled Rabbit (guess who?) tries to cool Taz's jets by impersonating a she-Devil, and in Ducking the Devil, that Daffy Duckster (woo-hoo!) makes a little music to soothe the savage beastie. The fun keeps cooking for restaurant patron Taz in Bill of Hare. Next, Taz does the fright thing in Dr. Devil and Mr. Hare and then proves that frightening does strike twice with Fright Before Christmas. Tazzy holidays! Apart from the descriptions of the two cartoons that were swapped out, the text is almost entirely identical to what appeared on the titles' 1996 issues, leading to not only things that were there before such as the "duck tape" pun on the Daffy cover (referring to the collection's original VHS release!) but also new curiosities like the odd typo before Hook, Line and Stinker on the Road Runner cover. We're not quite sure what these releases are intended for. Officially they're going to retail for $9.97, but that might mean these are being destined for the five-dollar dump bins/racks at Walmart and Target. If that is in fact the case, and assuming standards don't drop in the presentation of the cartoons, then we're cautiously optimistic about what this all means or could lead to. The Stars of Space Jam collections are scheduled to be released on October 9 on DVD only and will retail for $9.97 each. Amazon currently has product pages up for all five titles, but at press time they are not taking pre-orders, but keep checking! Because a video franchise isn't dead until it's been repackaged and reconfigured into every possible combination, today Warner Home Video released the Looney Tunes Spotlight Collection Volumes 1-3. Collecting the first two Spolight Collection volumes and the Looney Tunes Movie Collection, the three-disc set is now available in stores and online. Again, we're going by the label's own announced technical specs, but it looks as if they have in fact squeezed the content of six discs onto just three, as the original Spotlight Collection volumes were individual two-disc sets. No reviews have surfaced anywhere to either confirm or deny this, so we cannot comment on the resulting quality. With a thirty-dollar price tag on it, buyer should most definitely beware! And the Looney Tunes Movie Collection, taking the place of a "third" Spotlight volumes, contains both 1979's The Bugs Bunny/Road Runner Movie and 1982's Bugs Bunny's 3rd Movie: 1001 Rabbit Tales. Seriously, don't buy this. Please don't waste your money. Just buy the Golden Collection 1-6 boxed set and track down the Movie Collection (or even just the cheaper Spotlight Collection Double Feature that contains it) and you'll have everything that could possibly be released under the Spotlight Collection banner...and then some. Warner Home Video needs to know that people prefer the bigger, more expansive sets. Again, we stress that you shouldn't, but if you for some reason need it, the Looney Tunes Spotlight Collection Volumes 1-3 is now in stores on DVD only and retails for $29.98. Order it now on Amazon. You can't keep a good reissue machine down! Four years after Warner Home Video last resurrected the Looney Tunes Spotlight Collection title for a series of repackaged double features, the label is going back into the family-friendly well once again for a triple feature! Collecting the first two Spolight Collection volumes and the Looney Tunes Movie Collection, the Looney Tunes Spotlight Collection Volumes 1-3 three-pack has been announced for release on June 5. As most of our readers know, the Looney Tunes Spotlight Collection series was launched in 2003 as a lower-cost, family-friendly alternative to the default Looney Tunes Golden Collection volumes. Taking the safer and more general-audience-pleasing cartoons from the larger sets (typically whatever would constitute the "all-stars" discs on the Golden Collections), the Spotlight volumes usually shied away from anything controversial, almost anything that would be deemed "old" (so very little to no black and white shorts), and almost anything not starring a major character or wasn't all-but universally known--and there was nothing substantial in the realm of bonus content (no commentaries, rare footage, etc.). In all, eight Spotlight Collection titles would end up being released: seven cartoon compilations and the Looney Tunes Movie Collection serving as "volume three." And then, of course, the Looney Tunes Movie Collection contains both 1979's The Bugs Bunny/Road Runner Movie and 1982's Bugs Bunny's 3rd Movie: 1001 Rabbit Tales, while all the other 1980s compilation features have been made available as separate releases. Strangely, despite the fact that this release is collecting three, two-disc collections, all of Warner Home Video's official technical information suggests that this will be a three-disc set, not six. 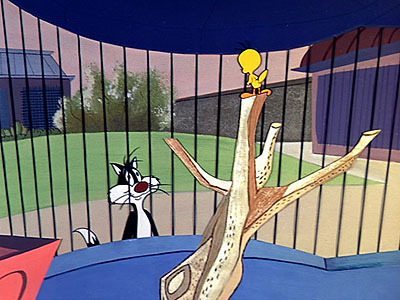 Now, this hasn't been the first time that Warner's press information on disc count has been incorrect (their official artwork for Sylvester & Hippety Hopper: Marsupial Mayhem, for example, clearly shows two discs coming out of the keepcase), and all of the other announced information seems to confirm that nothing has been removed from any of the titles being collected, so we'll have to wait and see what actually comes out. Theoretically it's not impossible to squeeze two regular discs onto a single dual-layered DVD9 (the resulting quality may not be that great, however), but it does seem like that would require extra work for what would otherwise be a simple repurposing of already mastered and imaged discs. Some collectors would argue that such time, money, and effort could be better spent elsewhere on the Looney Tunes franchise--but of course, we're also talking about a label that chose perhaps the ugliest of the Spotlight Collection covers to use for the front of this release. Looney Tunes Spotlight V1 - They're the clown princes of animation. They're the international ambassadors of cartoon comedy. They're the fabulously funny friends you grew up with! Some of the very best animated shorts starring the very wackiest Warner Bros. cartoon characters. Sparkling with one unforgettable, landmark cartoon classic after another, there's Bugs Bunny's monstrously merry encounter with the tennis-shoe clad creature of "Hair-Raising Hare." Wile E. Coyote and Roadrunner racing to cartoon immortality in "Fast and Furryous." Oscar-winning animated gems, scenery-chewing Tazmanian [sic - Tasmanian, as the character's name uses the proper spelling] Devils [comma needed] and much more! Looney Tunes Spotlight V2 - That's right, go ahead and laugh at them. The silliness picks up where it never left off in Vol. 2 of the Looney Tunes Spotlight Collection, a joy-buzzer-to-the-world batch of more classic animated shorts from the Warner Bros. vaults unleashes an all-star, all-for-fun-and-fun-for-all array of Hollywood and show-business spoofs, including the great "What's Opera, Doc?" and more. Laugh yourself silly! Looney Tunes Spotlight V3 - Lights, camera, Looney-ness! The Spotlight is on 2 Looney Tunes movies - now remastered so that every image shines and every fine Acme product goes swoosh like new. The chase is on in The Bugs Bunny/Road-Runner Movie as Elmer pursues the pesky wabbit, Daffy Duck tries to elude the animator's eraser [comma needed] and Wile E. Coyote tears after Road Runner and Bugs. By the way, how do you catch a Road Runner? You don't! Beep-Beep! More cartoon harelarity is what's up, doc, in Bugs Bunny's 3rd Movie: 1001 Rabbit Tales. Our long-eared hero becomes a spinner of fantastical stories while held captive in a desert sultan's palace. Yosemite Sam is the sawed-off sidewinder wielding the sultan's sword. Mad mallard Daffy joins the fun, coping (or not) with a meanie-genie. The rest, as they say, is...hysterical! Looney Tunes Spotlight Collection: The Premiere Edition - They're the international ambassadors of cartoon comedy. They're the fabulously funny friends you grew up with! And now, 28 of the very best animated shorts starring the very wackiest Warner Bros. cartoon characters have been rounded up in the Looney Tunes Spotlight Collection: The Premiere Edition. Each specially selected short has been brilliantly restored and remastered to its original anvil-dropping, laughter-inducing glory! It's an unprecedented animation celebration for cartoon lovers eager to relive the heady, hilarious golden age of Warner Bros. animation! It's the ultimate animated experience for anyone who's ever thrilled to the timeless query, "Ehhh...what's up, doc?" Looney Tunes: Spotlight Collection Volume 2 - That's right, go ahead and laugh at them. The silliness picks up where it never left off in Vol. 2 of the Looney Tunes: Spotlight Collection, a joy-buzzer-to-the-world batch of more classic animated shorts from the Warner Bros. vaults - all restored, remastered [comma needed] and uncut. 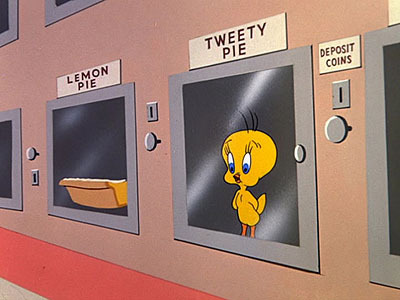 You'll tawt you taw a puddy tat and more with Tweety/Sylvester antics, Daffy Duck's detective Duck Twacy [comma needed] and the surreal Porky in Wackyland. Also includes an all-star, all-for-fun-and-fun-for-all array of Hollywood and show-business spoofs, including the great What's Opera, Doc? more. Laugh yourself silly! Looney Tunes: Movie Collection Volume 3 - Lights, camera, Looney-ness! The spotlight is on two Looney Tunes movies - remastered so that every image shines and every fine Acme product goes "swoosh" like new. The chase is on in The Bugs Bunny/Road Runner Movie as Elmer pursues the pesky wabbit, Daffy Duck tries to elude the animator's eraser [comma needed] and Wile E. Coyote tears after Road Runner and Bugs. By the way, how do you catch a Road Runner? You don't! Beep-Beep! More cartoon harelarity is what's up, doc, in Bugs Bunny's 3rd Movie: 1001 Rabbit Tales. Our long-eared hero becomes a spinner of fantastical stories while held captive in a desert sultan's palace. Mad mallard Daffy joins the fun, coping (or not) with a meanie genie. The rest, as they say, is...hysterical! Adding to the vagueness of what should otherwise be pretty much an autopiloted release, the back cover includes not one but two of the now-standard "aspect ratio boxes" that Warner puts on its titles. STANDARD VERSION PRESENTED IN A FORMAT PRESERVING THE ASPECT RATIO OF IT'S [sic] ORIGINAL THEATRICAL EXHIBITION. STANDARD VERSION THIS FILM HAS BEEN MODIFIED AS FOLLOWS FROM ITS ORIGINAL VERSION: IT HAS BEEN FORMATTED TO FIT YOUR SCREEN. WIDESCREEN VERSION PRESENTED IN A "MATTED" WIDESCREEN FORMAT PRESERVING THE ASPECT RATIO OF ITS ORIGINAL THEATRICAL EXHIBITION. ENHANCED FOR WIDESCREEN TVS. This is probably referring to the titles on the Movie Collection, but then that just leads to more questions. Even though both The Bugs Bunny/Road Runner Movie and 1001 Rabbit Tales were theatrically released in an open matte format, all previous home video releases have been in standard format without ever needing any "modified" disclaimer before--but Warner Home Video might just be trying to cover their litigious bases in the era of high definition, so we'll ignore that. What's stranger is the notation of widescreen versions supposedly being present on this release. Both BB/RR and 1001 were released in the Movie Collection in full frame only, so there shouldn't be any "matted" version of either film (unless there was some Easter egg we were never made aware of). Add to that the question of the number of discs and you get a very baffling release announcement, especially for what should again just be a straightforward repackaging of older discs. It'll be (only marginally) interesting to see if there are in fact any changes to the content or discs when this title does in fact come out. It's really hard to figure out who this release is intended for, especially for the almost-thirty-dollar asking price it's being offered at. The first Spotlight Collection was reissued at a lower price point just last year; and though it's out of print, the Spotlight Collection Double Feature containing the other two volumes isn't that hard or pricy to come by. And of course, the original Golden Collection volumes are all still readily available. It seems like there would have been better, more marketable ways to get the Movie Collection back out there (if that was the intent) without saddling it with so much redundant material. BUT, if you still need The Bugs Bunny/Road Runner Movie and 1001 Rabbit Tales, or are just morbidly curious, the Looney Tunes Spotlight Collection Volumes 1-3 is scheduled to be released on June 5 on DVD only and will retail for $29.98. Pre-order it now on Amazon. NEW SECTION TO THE SITE! Not a normal news update, but we wanted to officially announce a new page to our site, something that's been in the works for a while now. Tweet Teriyaki is a look at one of the curiouser Looney Tunes video releases this century, the trio of I Love Tweety collections made available only in Japan. You'll come across a brief history of the video line, screen grabs of cartoons not yet issued on disc over here in the United States, and (something that's often been asked for) comparison shots of cartoons eventually released in the Golden Collection series. 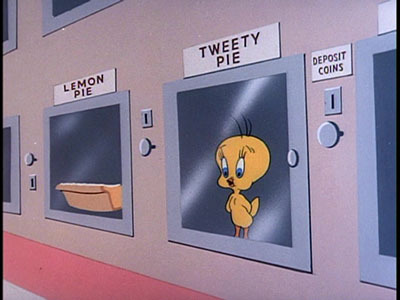 It's practically everything one ever wanted to know about the I Love Tweety series. And heeeeere we go! On Wednesday, March 21, Stu's Show, the online series hosted by cartoon/pop culture/television nut Stu Shostak, will again welcome to its studio Jerry Beck. As is the norm, the episode will be a video/audio simulcast, so you will be able to either listen or watch it live. The show will air at 7PM EST and is available as a free stream for those who tune in live (afterward, fans can purchase a "rerun" of the episode online). Information on the various ways to access the show can be found on its web site: www.stusshow.com. In addition to his recap of both the Annies and the Oscars, Jerry will be looking ahead at the year in animation, from upcoming movies and television series to (hopefully) any home video news. To take advantage of the video feed, Jerry will bring a few classic cartoons to show and offer comments on. Ideally this will be a far more entertaining interview than in December, when both Jerry and Stu were somewhat condescending over concerns fans had with Warner Archive's mediocre Porky Pig 101 collection. We will be posting live news updates as the episode airs on our Facebook page. If there is any major DVD or Blu-ray news announced, we will of course report it here after the show. Regardless, do plan to watch or listen to the episode yourself! Mark your calendar! Jerry Beck is coming to Stu's Show March 21! It's the day absolutely nobody was waiting for! While any collector-minded Looney Tunes slowly migrate over to the Warner Archive, today Warner Home Video proper followed their usual appeal to the big-box masses and released the Let Loose Triple Feature three-pack on DVD. Collecting discs from various older Looney Tunes-related titles, the three-disc set is now available in stores and online. The set collects the older releases Looney Tunes: Rabbits Run, Tweety's High-Flying Adventure, and the first disc from Taz-Mania: Taz on the Loose. After last year's release of Porky Pig 101 from Warner Archive and the subsequent controversy over its scattershot quality control, it seems almost refreshingly quaint that we can ignore yet another slapdash repackaging of titles that were more peripheral of the main Looney Tunes library in the first place. There is no classic material contained on any of the three discs, while the only shorts featured at all are the four recent CGI cartoons used as special features on Rabbits Run: Coyote Falls, Fur of Flying, Rabid Rider, and I Tawt I Taw a Puddy Tat. And merely for the sake of listing all of the bonuses, that disc also contains the Looney Tunes Show episode "Best Friends." Obviously, there's little reason to hunt down this release, especially since Rabbits Run has already been collected elsewhere and the complete two-disc Taz on the Loose is regularly seen in dump bins at bargain stores like Big Lots. This is strictly meant to be an impulse buy for parents at Walmart and Target. And for some quick housekeeping news. As is the norm we'll likely be creating a 2017 news archive in the near future and will be moving last year's news articles to such a page. Also, we're knee-deep in a major update to a main section of the site, so expect news on that hopefully soon. And of course, we'll be updating our Wideo Wabbit history section to include last year's release of Porky Pig 101 and the surrounding kerfluffle. God help us. Until then, Looney Tunes Let Loose Triple Feature is now in stores on DVD only and retails for $18.94. Order it now on Amazon.